Travelling out of Port Erin along Castletown Road at the Four Roads roundabout turn left onto Church Road passing Southlands on the left hand side and Rushen Primary school on the right hand side. 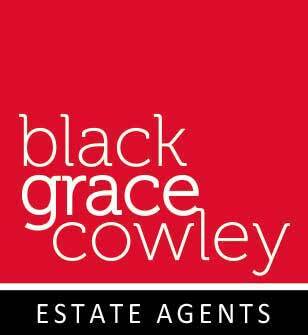 Proceed to the next roundabout and go straight over on to Ballakillowey Road where High Lea can be found on the right hand side clearly identified by our ‘Black Grace Cowley’ for sale board. Spacious hallway with stairs leading to the first floor. Understairs storage cupboard, telephone point. Square bay window offering fabulous panoramic views. Picture rail. Wide range of fitted base, drawer and wall units with wood effect worktops incorporating a stainless steel double sink with drainer and mixer taps. Electric oven free standing with grill, dishwasher, under counter fridge and freezer. Window overlooking the rear garden. Fully tiled walls and tiled floor. Large pantry. Oil fired central heating boiler. Door leading to integral garage. Fitted work tops incorporating a single stainless steel sink. Plumbing for automatic washing machine and space for tumble dryer. Tiled floor. Door leading to rear porch and garden. Half tiled walls with coloured suite comprising toilet and wash hand basin. Good size room extending into square bay window with stunning countryside views. Wonderful views over rear garden. Wash hand basin. Bright and airy landing. Loft access with slingsby style ladder. 3 piece bathroom suite comprising panelled bath, toilet and wash hand basin. 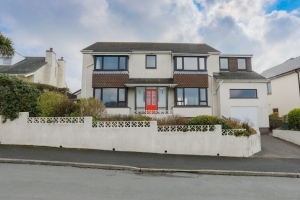 Views over rear garden and distant sea views. Double bedroom with square bay window again lovely views. Sliding glazed patio doors leading to balcony with glorious views over rear garden and distant sea views towards Gansey. Avocado 4 piece suite comprising panelled bath with plumbed shower and shower screen above, toilet, bidet, wash hand basin. Mostly tiled walls. Small front garden with raised beds with planted flowers and shrubs, easy to maintain. Parking for 1 car on driveway. Extensive, beautiful lawned garden, well stocked flower beds, shrubs, bushes, trees and fruit trees. Distant sea views. Greenhouse. Fitted shelves for storage. Light and power. Automatic up and over door. Fitted shelving for storage. Light and power.